Last August after protests followed Michael Brown’s murder, 19 journalists were arrested, according to the Freedom of the Press Foundation. Others were harassed, threatened, tear gassed, pepper sprayed and abused by other brutal police tactics. Let me be clear that our constitutional rights to speak freely, to assemble, and to report in the press must be vigilantly safeguarded, especially in moments like these. He prosecuted more whistleblowers of government wrongdoing than all his predecessors combined. He targets journalists for doing their job. They’re supposed to stay out of our business. (Even) Nixon didn’t” go as far as he does. “It’s blatant. They don’t give a damn if you know it or not. They demand no media reports on everything they want suppressed. Since Ferguson protests erupted on the one-year anniversary of Michael Brown’s murder by killer cop Darren Wilson, journalists again were targeted. This week alone, three were arrested and charged with interfering with on-duty police officers. What’s happening reflects war on responsible journalism – criminalizing reporters for doing their job. On Tuesday, Canadian TV (CTV) Los Angeles Bureau Chief Tom Walters was charged with interfering with police nearly a year after he was arrested covering Ferguson protests last August. At the time, he was pinned to the ground and handcuffed – then detained after asking Missouri Highway Patrol Capt. Ron Johnson a question. Video recorded his arrest. He was then released uncharged after over eight hours in detention. CTV News strongly condemns the charges filed by St. Louis County against CTV News correspondent Tom Walters while he reported on the protests in Ferguson, Missouri last August. Tom has the full support of CTV News as we fight these charges. Almost a year ago, (he) was arrested and detained for eight and a half hours for simply doing his job. As an organization that covers news both in Canada and internationally, CTV News is unwavering in its commitment to defending the rights of all journalists. This week, Huffington Post’s Ryan Reilly and Washington Post’s Wesley Lowery were arrested and detained – charged with trespassing on private property and interfering with an officer by failing to follow “repeated commands to immediately exit” a McDonald’s restaurant. Both reporters were arrested last summer after being ordered out of the same McDonald’s during protests. They face a possible year in jail and $1,000 fine. 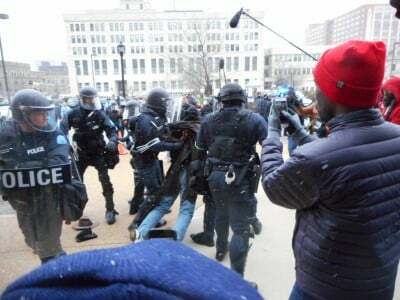 Cops nationwide complicit with Homeland Security, FBI operatives, and other federal security agents routinely target legitimate protesters for justice. They’re involved in Ferguson. In 2011, Occupy Wall Street activists were viciously targeted in numerous cities across the country – harassed, beaten, kicked, dragged, pepper-sprayed, tasered, painfully handcuffed for hours, arrested and detained. “US authorities have no business hauling reporters into court for doing their jobs, especially on a world story like Ferguson. We are appalled by this judicial intimidation…and call on St. Louis authorities to drop all charges immediately” against arrested journalists. If protests continue through the week or longer, it remains to be seen how many more journalists will be brutally targeted for doing their job.